Most organizations have to have a plan to communicate emergency procedures. Sometimes this is done by HR on a regular basis, in other cases facilities management or other dedicated groups do the work. This information needs to be kept current and process maps are a great way of communicating the most up to date versions. In this example, a series of commonly used procedures are shown. The Emergency Procedures Process Map was created to show how an organization might go about handling various emergency situations that occur. 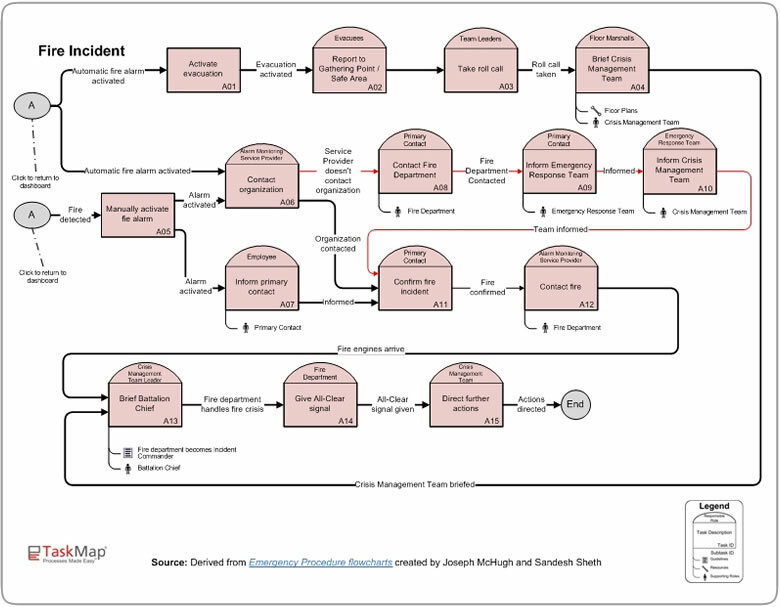 The process map is meant to serve as a basic guide for handling emergency scenarios. Further instruction may be required in order to implement these procedures in your organization or to customize the procedures for your organization’s needs. If you would like one of the consultants from the Harvard Computing Group to assist you in implementing Emergency procedures in your organization please contact us here. Map courtesy of Harvard Computing Group, Inc.